What Lexie Loves: France 2017! Hola Lexicans! As some of you may know from my previous post, a couple of weeks ago I came back from a holiday in France. I had an amazing time, and thought I would share some of my photographs, as well as a short write-up on the holiday. We spent the majority of our holiday in a little town in the South of France called Sainte Maxime, which is near Saint Tropez and Nice. Since our grandparents actually own an apartment there, this was not the first time we have visited the town - my family and I used to go a lot when I was little, and we also went there in 2014 and 2015. We are so lucky to have grandparents who have a holiday home in France and that let us use it! As we had decided to drive down to the South, rather than flying, we had to stay the night on the way down and back up, as to break up the long journey. On the way down we stopped off at Beaune, a beautiful city in the middle of France. Once again, this was not our first time visiting as it was our stop on the way back in both '14 and '15 so we already knew the city quite well. Because we knew how much we liked it as a place, we actually stopped of there for two nights so we would have a day to explore. We were staying in the hotel 'Le Panorama' which I would whole-heartedly recommend, with nice rooms, gorgeous views, friendly staff and a good range of facilities (e.g. a games room, a swimming pool etc.) 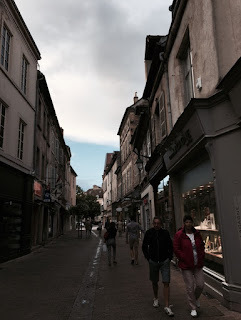 Beaune was a very photogenic city so many photographs were taken there! I've included a couple of my favourites below. Then we drove down to Sainte Maxime and for this we had a shocker of a journey. We were expecting it to take around 6 hours, but it ended up taking 10! It was a very boring, and hard journey but on the way we passed some beautiful, beautiful towns and went on a route up the mountains (I took a couple of photos during the journey so will put one below), but we finally arrived! Sainte Maxime is right on the coast of France, so the beach is about a 5 minutes walk from the apartment and we spent most of our week either lounging on the sand, playing in the sea or chilling in our apartment. On a morning half way through the week there, we took a short boat ride over to the very famous Saint Tropez, to look at the yachts, do a little shopping and have a lunch. We also spent one of the days with some family friends also staying in the South at the time and another at Aqualand, this really fun water park filled with different pools and slides. I took this on the way to the South of France when we stopped off to get ice-cream! And finally, we drove down to Dijon for just one night before heading back home the next day and were staying in an Ibis Styles hotel there. For me, Ibis has the reputation of being a cheap, plain, not very nice hotel but I'm not sure if it's just because it was one of their 'Styles' ones but it was LOVELY, and I would 100% recommend if you're on a budget. Once we got there way it was later than planned (another shocker of a journey unfortunately) so we didn't actually get to have the afternoon exploring the city like my parents had hoped. We spent most of our time there sleeping and had to leave the next day. Despite this what we did see was beautiful - we had a lovely evening and saw enough to know this: we definitely want to come back, just this time, for more than about 16 hours or however much time we spent there! Whoo! That was a long post, but I guess I had a lot to get through! Which of my photographs were your favourites? Isn't France such a photogenic country? Did you go anywhere this summer? I think it'll make other people want to visit France & Ste Maxime - but not in high season when the traffic is so heavy. Thanks Grandad. Love you lots!